Most of the front heroes are melee and strength type but it doesn't matter as long as your hero is a high level or upgraded. Front heroes absorbs the melee damage from enemies and the first to be hit by enemy heroes ultimate, except for the aoe ultimate. Front heroes have higher HP than central and back heroes, so you need to improve front heroes to protect your other heroes. Most of the central heroes are range and int type. 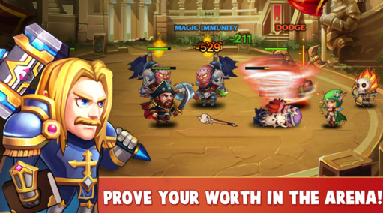 This heroes have pure damage skills, upgrading these heroes will increase your damage output. Most of the back heroes are range and agi type. 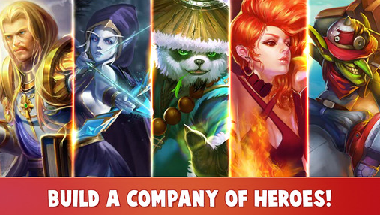 There are only 5 back heroes, each of there skills are unique and it has different effects to the enemies. For each stages there are 3 levels of enemy mobs. If your team consist of 4 heroes that has an aoe ultimate skills and 1 hero that has an single target ultimate skill, you can make stage level 3 more easier! Just have a full MP when you enter at the stage level 3. Cast your 4 aoe ultimate skills immediately before you can cast your single target ultimate skill. If the front enemy is not a tank or the boss is the front enemy, the boss will be instantly killed (depending on how powerful your skills are). If the front enemy is a tank, by using this strategy the tank will be killed instantly and your next enemy would be likely a low or damaged boss enemy. You can fight in arena without using stamina. You will be given 4 random players to fight with and you can have 5 chances daily. You can get diamonds as a reward, you can claim it in your mail. Fights in arena are automatically AI controlled which means when your hero reaches it's Maximum SP pool, it will automatically casts it's ultimate skill. If you successfully defeated an enemy hero, you're rank will increase.